The N.C. Chronicles. : Feminism; the cause; the lost of moral values. Over the last decade or two, many women in the United States have distanced themselves from the feminist movement. It appears that a growing number of them associate feminism with anger and hostile rhetoric and have therefore concluded that they are not really feminists. This was reflected in a recent Time/CNN poll which showed that although 57 percent of the women responding felt there was a need for a strong women's movement, a full 63 percent said they didn't consider themselves feminists. And those who have distanced themselves from the feminist movement are our daughters, the idea that all men are vicious controllers and abusers has become an old message that is not compatible with what they experience in the real world. These girls also do not agree with the perception that they are permanent victims. One does not have to go far to see men bashing in our society, the step it up campaign during the Ontario election did not amass the needed followers to put them in the forefront of women's rights in Ontario, their facebook page did not attract enough support to be taken seriously, and their web page only bashes men. Women's rights is parallel to equal rights, daughters and sons, especially in our schools, and their message of girls are always at risk does not capture their imagination because girls in our society can take care of themselves and also look after each other. The very few that do have problems are because of their inability to understand where they belong, and that is the problem, they are told they are victims by these feminist, and to a young person in transition to adulthood this can be very hard to understand and be an extremly destructive message. The damage they are doing causing teen suicide is the message that as a victim, that this will be the norm for the rest of their live. What we have to do is to remind them, no one is a victim, family and friends are always there for support, that they are as important as the next person, the inner strength of a person is capable of overcoming any situation, and no one is a victim unless they believe themselves to be one. A strong family moral value is the answer to this type of message, which is nothing but destructive and has messed up our society for the past 20 years. Treat a child like a young adult and they will try to behave like adults, and if they are not ready for it, mistakes are made and usually the wrong ones, after all, adults to them do not go to their parents for help, they try to handle it themselves and that is the problem of teen suicide, nowhere to turn. 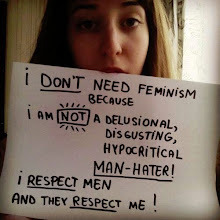 Radical feminism is as destructive to equal rights as chauvinism is, there is no difference between the two, both represent the minority of men and women, and both have no place in a future society. Who is against radical feminism; Helen Andelin, Fascinating Womanhood, F. Carolyn Graglia, Domestic Tranquility: A Brief Against Feminism, Mary A. Kassian, The Feminist Mistake, Linda Kelly, Disabusing the Definition of Domestic Abuse: How Women Batter Men and the Role of the Feminist State,Mary Pride, The Way Home: Beyond Feminism, Back to Reality,Phyllis Schlafly, The Power of the Positive Woman, Esther Vilar, The Manipulated Man, Elizabeth Fox-Genovese, Feminism is Not the Story of My Life,Gertrude Himmelfarb, The De-moralization Of Society, Christina Hoff-Sommers, The War Against Boys: How Misguided Feminism is Harming Our Young Men, Christina Hoff-Sommers, Who Stole Feminism? Kate O'Beirne, Women Who Make the World Worse, Daphne Patai, Professing Feminism: Cautionary Tales from the Strange World of Women's Studies,and of course Erin Pizzey who founded the first refuge for battered wives in 1971. This is literature describing the takeover of the women's rights movement by those who see it as a self promotion or an ideal that is destructive to our future. Notice that all these writers are... women? Women's right is as important as men's rights, equal rights for all are not just words, they are a needed implementation for a just society, to be a role model so our kids can follow our footstep and have someone to go to, instead of trying to depend on twisted people who sees them as an addition to their political power. The dependence on family must take the forefront of any dispute, someone to go to, someone who knows the child's character and situation, not some old ideals of personal victimisation. After all, does someone who studied women's issues at some university or just happens to be a volunteer at some center know the character and behaviour of your child, and could not mistakes be made if the wrong advice is given, culminating in more problems? And maybe even suicide. Maybe this is why teen suicide is on the rise, they don't know were to go, or what to do. A hug and "talk to me" from a parent goes further than, "you will always be a victim". One does not have to go far to see what they teach in schools, take a look at video below and make your own decision, we as family tell one thing to our kids and once in school another ideal is pushed, completely contrary to what family is. Schools are the domain of parents and moral values, not a place to promote political agendas. To teach is to teach all sides. If life is not respected, life does not respect us, without moral values, the insecurity of a young person grows, never to know what to believe, or were they belong. This is an open war on moral values of the families inter dependence on each other, the institution of the state knows best and life is not as important as the state is what we are up against. Planned Parenthood reps tell students to ignore ‘science’ about when life begins.